A miserable Bernie Sanders supporter was spotted at the Democratic Convention in Philadelphia, and it just so happened to be Academy Award- and BAFTA-winning actress Susan Sarandon. It could have ended there, but it didn’t. The video went viral, and McKenna received a response from the celebrity herself. “Accurate,” Sarandon tweeted, adding a link to the animation. — Susan Sarandon (@SusanSarandon) 26 июля 2016 г. The situation inspired humor from online spectators, who responded with their own funny GIFs. — Christian (@TalkNerdyToMe72) 26 июля 2016 г. @SusanSarandon I'm with you. Saddened, disappointed, disgusted. — #SeeYouInPhilly (@prattlandia) 26 июля 2016 г. - @SusanSarandon if you're having such a bad time, look for the signs that say EXIT. And this is coming from a Bernie supporter. 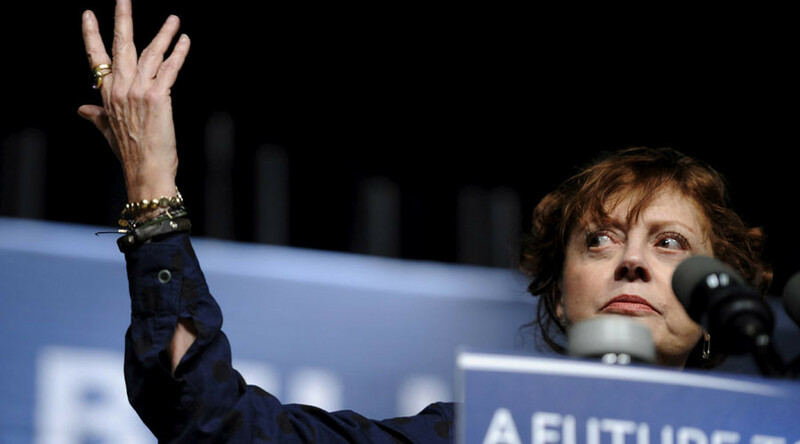 — FactCheckB4UForward (@jodmentum) 26 июля 2016 г.
Sarandon is known to be a fierce Bernie Sanders supporter, and called Hillary Clinton "more dangerous” than Trump following the DNC leaks. In an interview with Jordan Chariton of The Young Turks on Monday, Sarandon slammed the “disgusting” Democratic National Committee (DNC) for supporting Clinton following the leaks.